Do You Have Your Total Tech Fun Pass Yet? The Total Tech Fun Pass (our newest rewards program) is a must-have loyalty card for all our customers—whether you discovered us for the first time this year or have been with us since we opened in 1991. Visit us at 1380 Speers Road in Oakville. Tell us a bit about yourself (your name and how we can keep in touch). We’ll activate your Fun Pass on the spot, so you can start earning rewards right away! 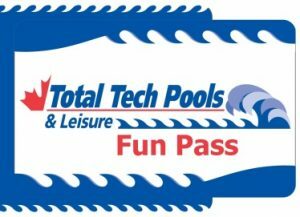 Show us your Fun Pass whenever you visit our pool store. For every $500 you spend in store, we’ll send you a $20 gift card you can use on maintenance products, accessories, chemicals, games and toys, equipment, and much more! So don’t wait—come see us today to get your Fun Pass! *Customer details will be required to activate card. Fun Pass cards are non-transferrable. Total Tech Pools has been providing pool services to customers in Oakville, Burlington, Mississauga and the surrounding communities since 1991. Contact us today to discuss your needs! Thank You for Voting Total Tech Pools the Best Pool and Best Pool Service Company in Oakville! Dave Warren has been the president of Total Tech Pools & Leisure for more than 25 years, successfully developing the business into a one-stop pool shop. He is a Past President and currently serves as Secretary of the Pool and Hot Tub Council of Canada. He also serves on the Retail Council for APSP and is Chairman of the Retail Education Task Force. Additionally, he is a founding member of WAPSA (World Alliance of pool and Spa Associations) formed in Cologne, Germany in 2017. Dave believes in giving to those in need both locally and abroad, which is why Total Tech donates to a variety of charities, largely focusing on children and animals.